The dog named as maremma sheepdog is developed in Italy. This dog is an exceptional working dog and their basic work in the past has been and to date still is being a protector of properties and flocks. The Maremma sheepdog has an elegant look, they are strong and present themselves with respect and dignity. This breed of dogs is tall, strong, tough and has a unique expression. The Maremma Sheepdog breed is a strong and truly working dog, it does not possess the usual habits of a lazy pet. Because of there loyal nature the maremma sheepdog is usually used for protecting farm, house, and family by their owners. They are very intelligent and attractive and do well with other dogs and enjoy themselves with children. They are very watchful, attentive and dedicated with their work. 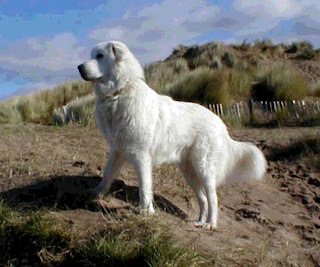 The Maremma sheepdog require regular brushing to remove their dead hair and dirt. They need extra care during heavy flaking periods. The ears and hair of this dog breed should be checked regularly. This breed is known for its double coat an outer harsh, thick and slightly curly coat and the under coat is soft and silky. Their coat is protective in every kind of weather. The Maremma sheepdog sheds a lot of its hair twice a year. This dog breed needs early socialization and compliance. This dog breed respects their master, is quite friendly and happy to play with it's owners. Training must be given regularly and sympathetically to this breed of dogs. The Maremma sheepdog is not for apartment or city living because they are not good in a crowded environment and are not suggested to live in a small house. This dog needs a rural environment because they need a lot of physical exercise and mental inspiration. Because they are very tough and strong they are not known to have any major heath issues or dog diseases. But it should be kept in mind that warm climates are not good for the Maremma Sheepdog breed of dogs.